Fabric has a right and wrong side. Sometimes you can't tell the difference and that's ok. 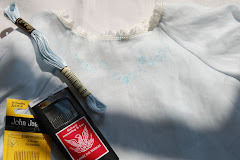 But with Satin Batiste there is a right and wrong side and even if you can't tell the difference now, you will notice it when this Daygown is complete. So pay attention! The shiny side is the right side. Stitch embroidery floss onto fabric and tie knot on wrong side before Pretreating fabric. It is easier to tell the right from wrong side before you wet the fabric. 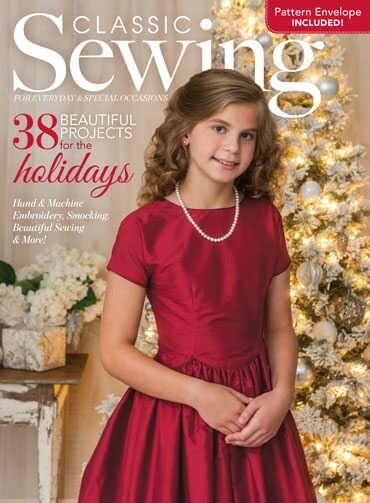 Take a stitch with light colored embroidery floss and tie the knot on the wrong side. It will be there after you pretreat. 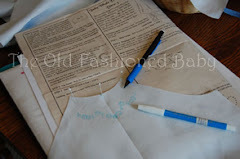 If you can not tell the difference between the right and wrong side - don't worry, just make sure you mark the wrong side on each garment piece after you cut out. More on that later. 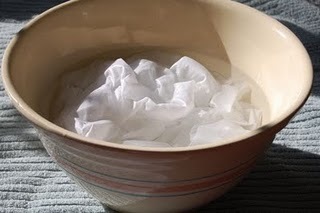 Pretreat your fabric - Visit HERE to see how to do this. Do not do anything to your lace! Are you ready to begin?? 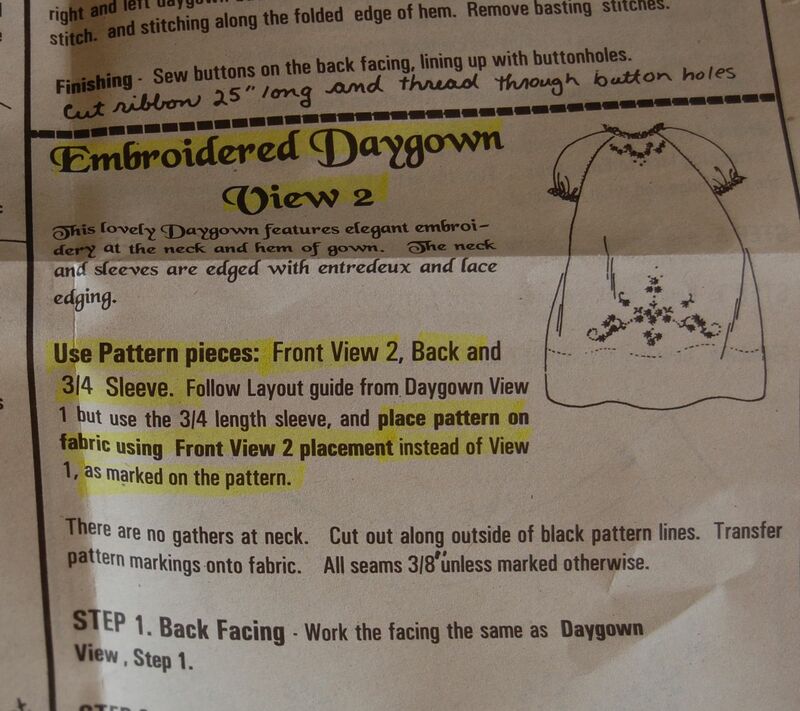 We are using the pattern Embroidered Raglan Daygown. I like to use my highlighter on my Instruction guide. 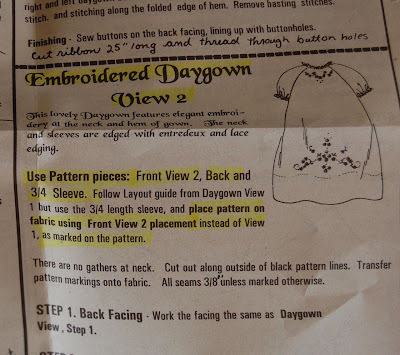 Instruction Guide - Your Instruction Guide for Embroidered Raglan Daygown is the valuable tool that tells you what you need to know to make your garment. It will tell you the order to put the pieces together and the method that should be used to put them together. 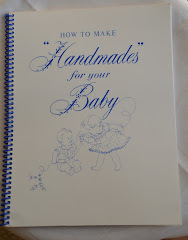 So get your Instruction Guide out. You will need to read all the instructions for review, including the General Instructions at the first part of the guide. We are making View 2. The instructions refer us to View 1 for the layout guide. You will use the pattern pieces listed in View 2 and follow the layout in View 1. 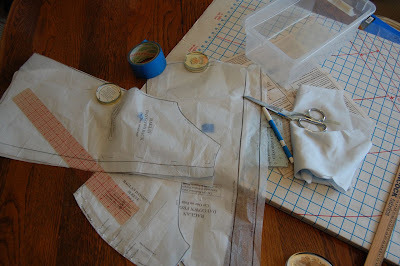 You need to cut apart the pattern pieces you will use (do not cut around the lines like a paper doll, just separate them). I like to press mine with a dry iron to flatten them. No Steam! Be gentle so the pattern doesn't tear. The Back Pattern piece has been turned over to fit the layout. 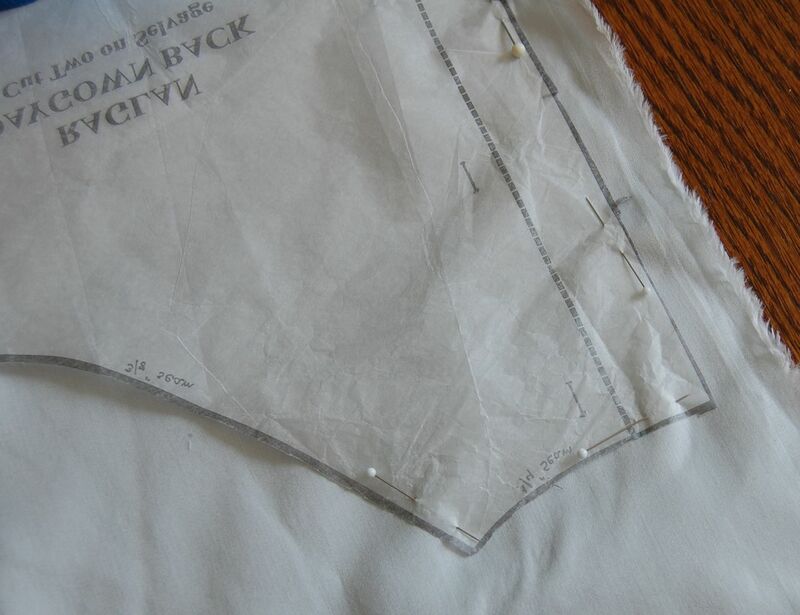 Layout your Pattern - Fold the fabric as directed with selvages meeting, right sides together. Smooth out all the wrinkles. Lay the pattern on top of the fabric as directed on the Layout Guide. 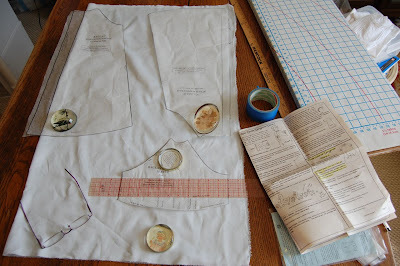 Use pattern weights to keep each pattern piece in place while you arrange them. When you have them just right, then you are ready to pin them in place. This saves you the unpleasant task of unpinning the pattern to re-arrange it. 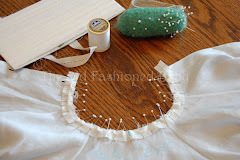 Pinning the pattern - Use fine silk pins if you have them. 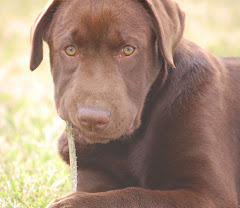 I like the kind with the glass head. 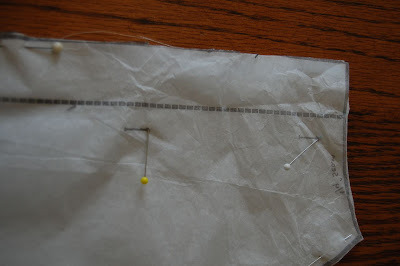 We want to make sure the pattern is laid onto the fabric correctly before we pin it in place. Read the markings on the pattern pieces. The Daygown Front must be on the Fabric Fold. 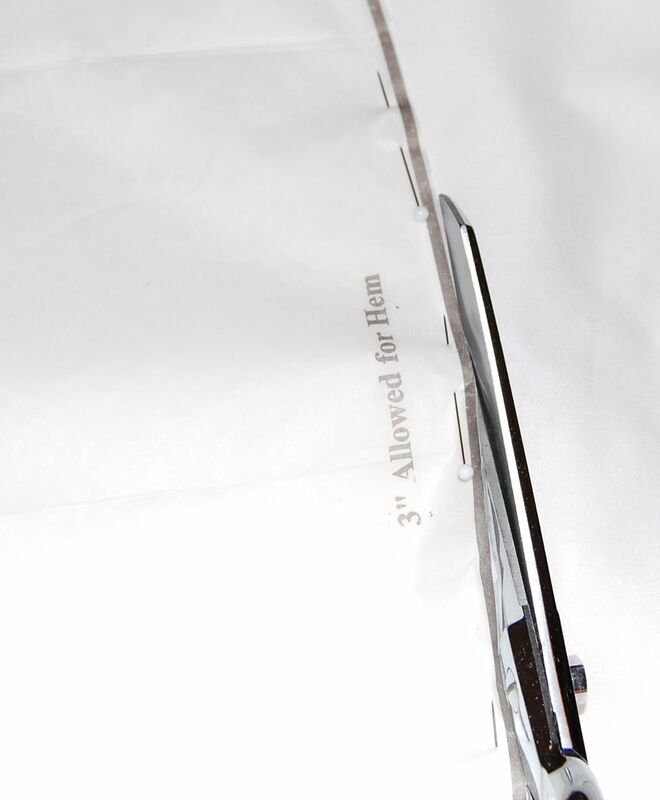 Notice how the Front Pattern piece extends off the fabric fold. If you look at your pattern you will see that one line is used for View 1 and another for View 2. 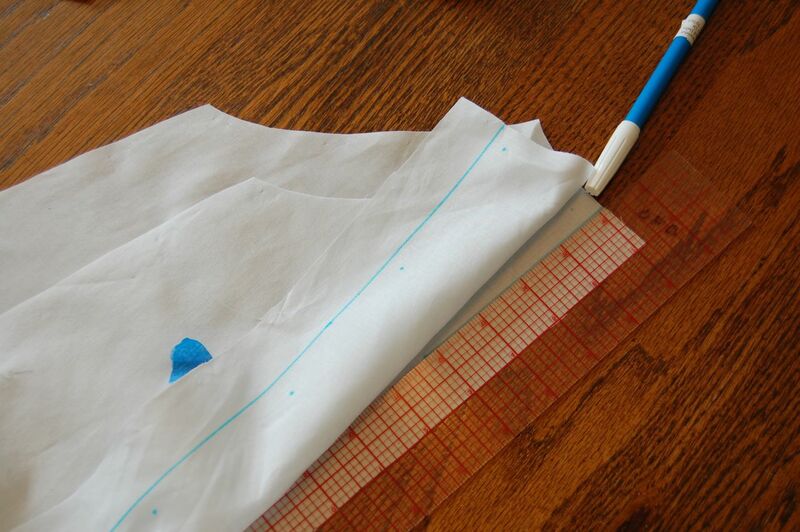 Be sure to place the pattern on the fabric using the View 2 line. 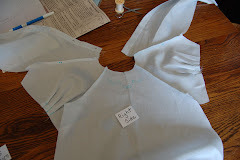 The Daygown Back is placed along the selvage. We don't want to line the pattern up right along the selvage because the fabric weave is tighter there and can cause your gown to pucker. We will avoid the edge and move our pattern piece in about 1/2" to 3/4". 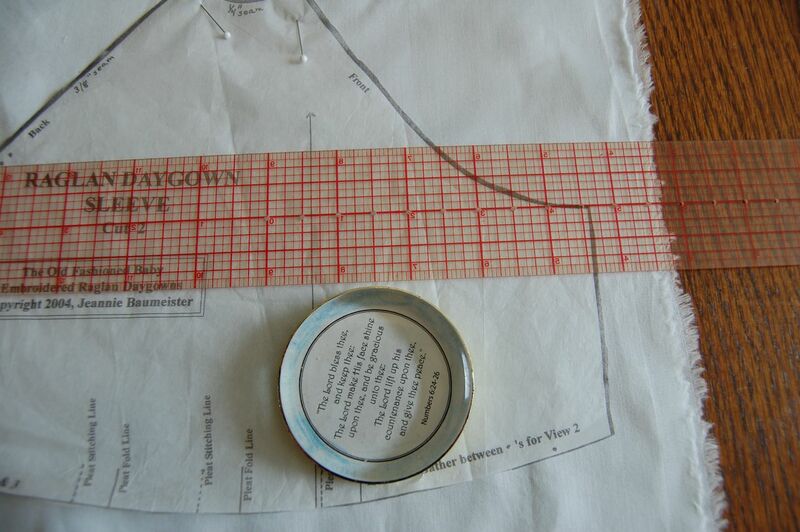 The seam allowance for this Daygown is not large (1/4" and 3/8" in places) so it is important to pin the pattern securely to the fabric. If the pattern slips while you are cutting, you can change the seam allowance which will affect the garment pieces going together nicely. Place the pins along the cutting line, close to the cutting line to hold the fabric in place. The sleeve has a straight of grain which must be followed. This affects the fit and the look of the finished garment and is very important. 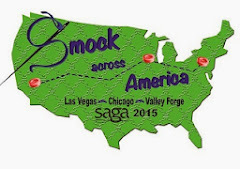 Pattern pieces that are not placed along the selvage or the fold usually have a Grain Line printed on the pattern. It is a straight line with little arrows on either end. 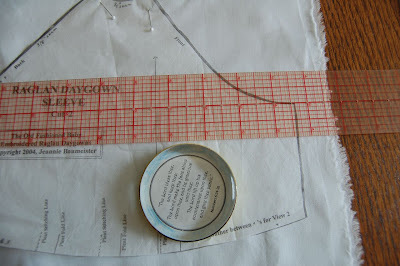 The Grain Line needs to be parallel to the selvage of the fabric. Scissors cutting along the outside of the black cutting line. Cutting Out - Cut on the outside of the black cutting line. If you cut inside the black cutting line, you are cutting the pattern smaller than it was designed to be. Marking the buttonholes - Mark the very top of the buttonhole. 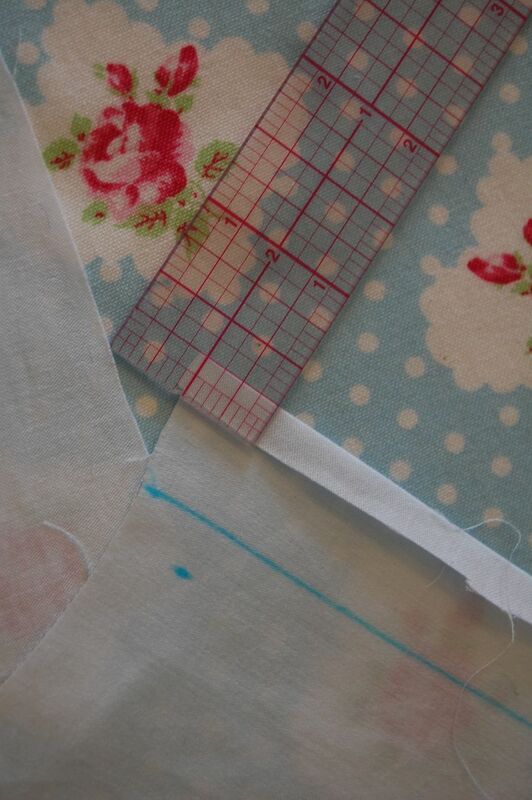 Marking the Fabric - Use a wash out fabric marker or pencil to mark your fabric. I use the Marks Be Gone wash out fabric marker. I never use the purple marker because it doesn't come out as easily. When using this marker, you must be sure to immerse the fabric in cold water to remove the chemical when daygown is complete . Never put it in warm or soapy water. Or leave it in the sun. Poke a pin through the pattern in the place that needs to be marked. Shown above - Marking the Buttonholes. Make a dot (with a washout fabric marking pen or pencil)at the top of each buttonhole to mark the placement. We will mark the exact button hole later, using our button as our guide. 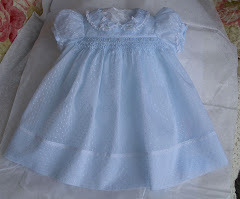 Put a piece of blue "painters tape" or masking tape on the fabric to mark the wrong side of the daygown. 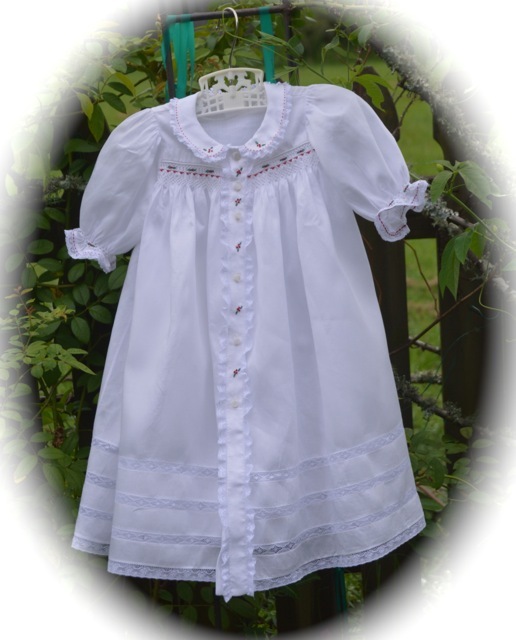 Be sure to mark each daygown piece. In the picture above you also see me marking the fold line of the back facing. I measured the pattern to see how far from the raw edge to mark the fold line. 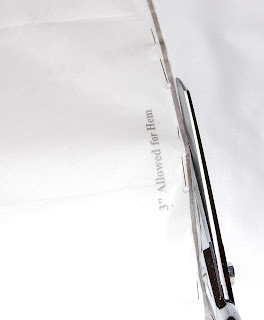 If you don't like to use a marking pen, this can be done by simply measuring and folding. 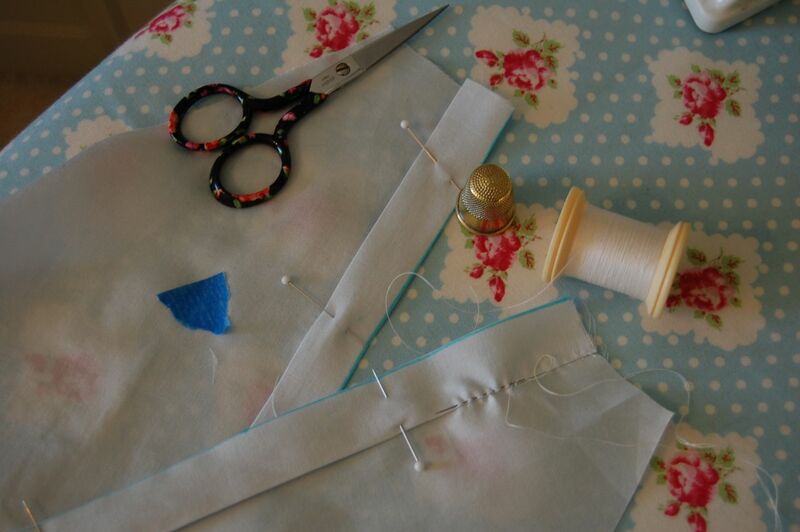 I don't want to end this lesson with out stitching something!! 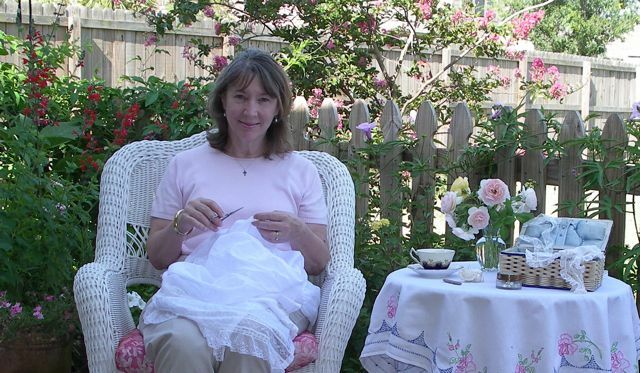 I am stitching my Daygown by hand. Machine Stitchers are Welcome too! STEP 1. Back Facing - The instructions guides tells you to see Step 1 in View 1 for directions. Follow the instructions on the guide. Turn under raw edge of facing 1/4" to the wrong side and press. Then turn facing along the fold line to the wrong side. Press. Facing is turned to the wrong side and pressed. Put a knot in your thread and hide the knot under the facing. Pin the facing down so it doesn't shift as you stitch. Work the Running Stitch (click on blue Running Stitch for directions) along the edge of the fold. 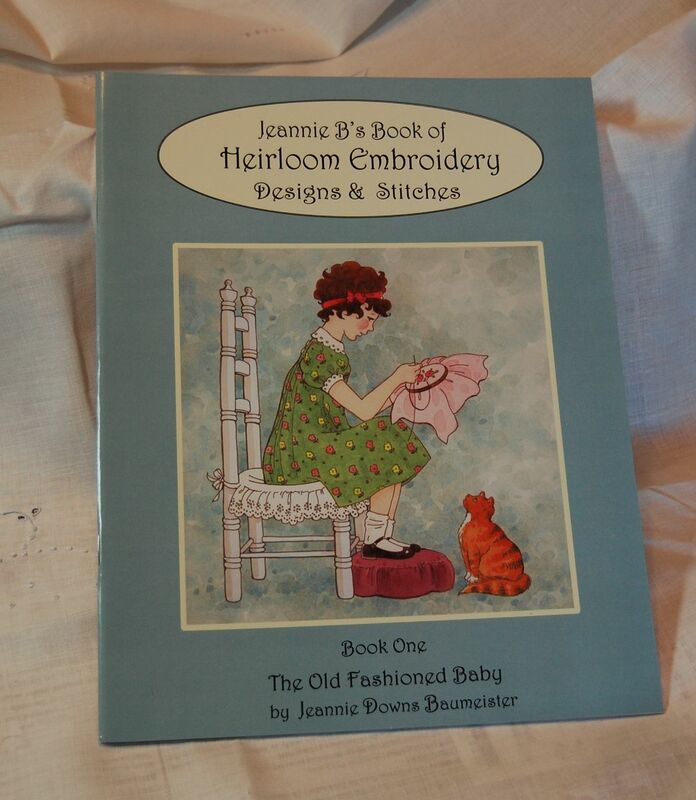 The Running Stitch is used for most seaming when stitching by hand. 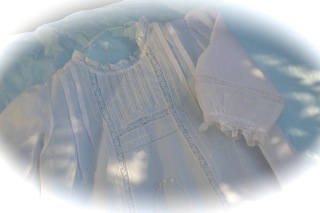 In areas of your daygown that will be trimmed, such as the neck edge, it is important to knot the thread in anticipation of the trimming. For instance - when we are at the point in our daygown where we stitch the entredeux to the neck edge , we will trim off excess fabric. That means the knot that was at the very top of the seam we just stitched, will be cut off. Therefore, we will knot the thread just inside the 1/4" seam line at the neck edge. 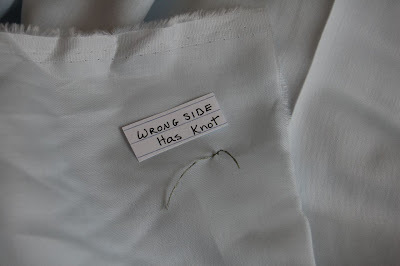 To do this you will tie on as above, take a stitch or two and make a knot in your fabric. 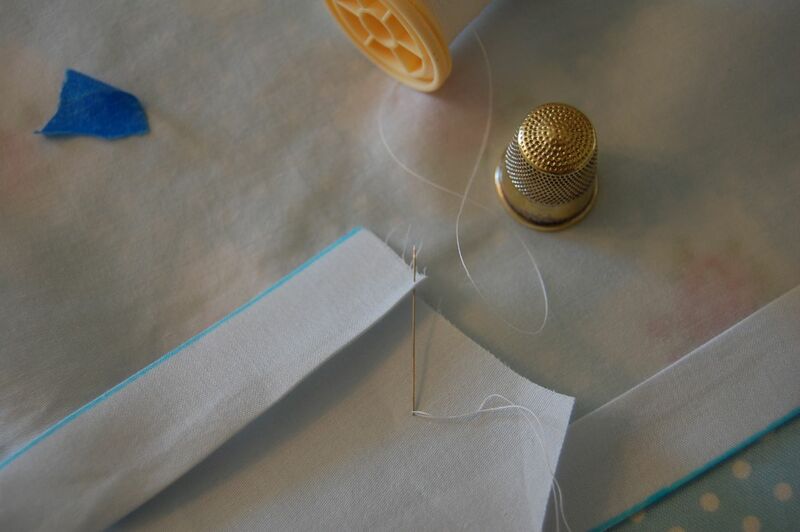 Then continue the Running Stitch to the end of the seam. Smooth out the fabric after pulling the needle through the fabric. 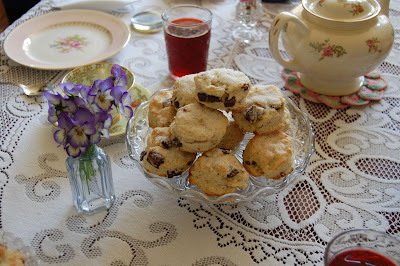 Now its Time for Tea!! I made you Chocolate Chips Scones and Earl Grey Tea. Enjoy and thank you for coming. 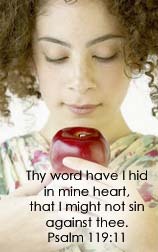 To post questions, return to the Lesson One Post and leave a comment/question.